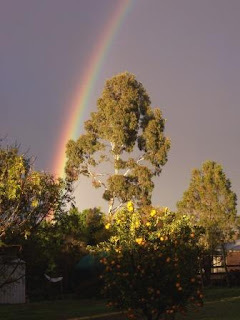 It started off at dawn with this rainbow and the promise of some much needed rain. Well it rained all right. In fits and starts all day - sometimes sunshine - sometimes squall. At lunch time we had what I can only describe as "ice rain". It was similar to hail, but much finer and a lot of it. A little dog from the neighbourhood was running around the front of our yard and he had all these little icy particles over him. Very comical. Our dog was much wiser and stayed on her sugar bag mat on our porch out of the wind and rain and ice. As I write, the sun is out again but who knows for how long??? You have been busy, and I always love a rainbow. Monday I got to drive home in hail, thankfully only for a very short time and very small hail. What weird weather. Pop on over for a visit, I have something for you.